The Chart of the Day belongs to Broadridge Financial Solutions (BR). 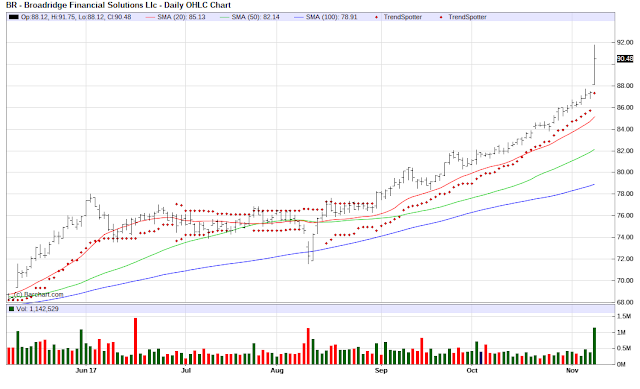 I found the outsourcing stock by using Barchart to sort today's Top Stocks to Own list first for the most frequent number of new highs in the last month, then I used the Flipchart feature to review the charts for price appreciation consistency. Since the Trend Spotter signaled a buy on 8/31 the stock gained 15.81%. Broadridge is a leading global provider of technology-based outsourcing solutions to the financial services industry. Their integrated systems and services include investor communication, securities processing, and clearing and outsourcing solutions. Broadridge offers a broad, integrated suite of innovative global solutions across the investment lifecycle and provides awide range of cost-effective and scalable solutions to the financial industry. Their systems help reduce the need for clients to make significant capital investments in operations infrastructure, thereby allowing them to increase their focus on core business activities.